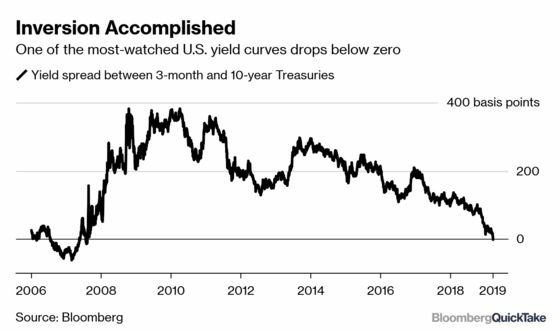 (Bloomberg) -- If you’re wondering what a yield curve is and why there’s so much fretting in the U.S. over it flattening -- and parts of it even inverting -- you’re not alone. Late last year, Google searches for “yield curve inversion” shot up to their highest level ever. Here’s what the fuss is about. 1. What’s a yield curve? It’s a way to show the difference in the compensation investors are getting for choosing to buy shorter- or longer-term debt. Most of the time, they demand more for locking away their money for longer periods, with the greater uncertainty that brings. So yield curves usually slope upward. 2. What are flat and inverted yield curves? The yield curve has historically reflected the market’s sense of the economy, particularly about inflation. Investors who think inflation will increase will demand higher yields to offset its effect. Because inflation usually comes from strong economic growth, a sharply upward-sloping yield curve generally means that investors have rosy expectations. An inverted yield curve, by contrast, has been a reliable indicator of impending economic slumps, like the one that started about 11 years ago. In particular, the spread between three-month bills and 10-year Treasuries has inverted before each of the past seven recessions. 4. What’s been happening with U.S. yield curves? The flattening trend that took the market by force at the end of 2017 continued through 2018, as the Federal Reserve continued to raise short term rates. But in March, the central bank policy makers lowered both their growth projections and their interest rate outlook, with the majority of officials now envisaging no hikes this year. That’s down from a median call of two at their December meeting. Concern about a possible economic slump and the prospect of the Fed having to cut short-term rates led the yield gap between 3-month and 10-year yields to vanish in a surge of buying that pushed long-term rates sharply lower. A Federal Reserve Bank of San Francisco paper on the squeeze on the yield curve. Frequently asked questions on the yield curve from the Federal Reserve Bank of New York. A Federal Reserve Bank of Richmond paper wonders whether yield curves may now invert for reasons other than recession risks.